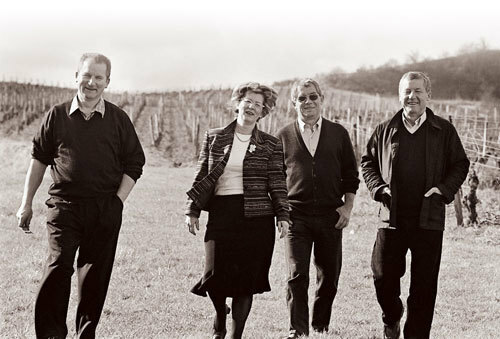 It was Désiré Rolet who in 1942 began making wine in the small region of the Jura in eastern France. In 1958, his 4 children all decided to stay in the family business and took over from their father. Since that time the domaine has rsien in prominence in the region and acquired prime old vine vineyards in the appellations of Arbois and Côtes du Jura. From the beginning, quality farming has been the focus; today the domaine is undergoing a complete conversion to organic farming, which in their steep-sloped vineyards can be quite difficult indeed. No herbicides or pesticides are ever used and the soils are constantly ploughed – creating beautiful, healthy vineyards. The commitment to quality viticulture extends into the cellar where they produce balanced, mineral-driven wines that can only come from the Jura. The wines always exhibit a focused purity and intensity of flavor which maintain the cool climate typicity of this mountainous region.